Alternative Dubstep Orchestra was conceived in November 2010 as an experimental collaborative project to showcase, unite and celebrate world class turntablists alongside world class musicians. This video was filmed in the legendary Highbury Studio, Birmingham, which has become home to ADO rehearsals. This film features Alternative Dubstep Orchestra version of Cockney Thug by Rusko, as well as some samples of some works in progress. 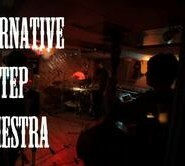 music video for Alternative Dub Step Orchestra from Blue Hippo Media on Vimeo.